A somewhat odd map can be found here. 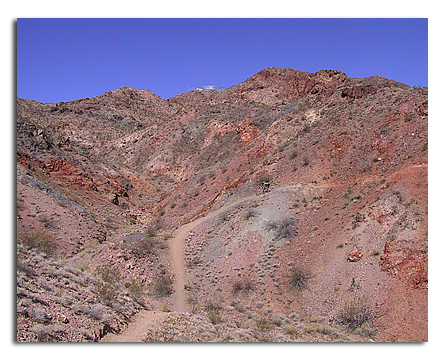 Bootleg Canyon is east of Vegas almost to Lake Mead. 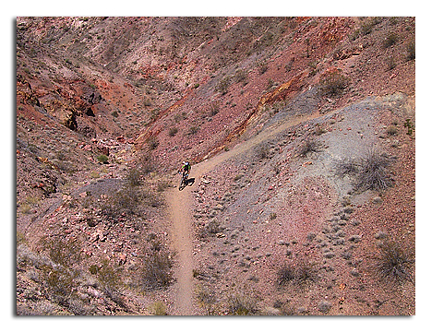 Lots of nice swoopy, very desert-ey trail, with some nice views. 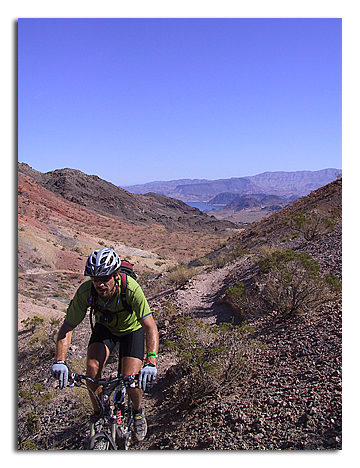 This was the second day of outdoor demo for Interbike 2003. Every major manufacturer as well as many minor manufacturers were out there with bikes. 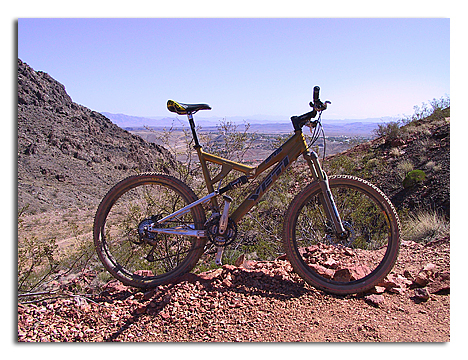 For the asking you could take them out on the trails. The options were overwhelming. 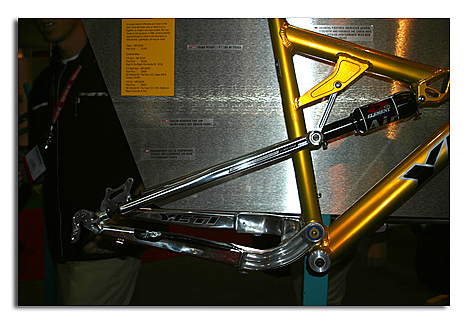 There were downhill bikes, road bikes, bmx, comfort, cross, recumbents, hardtails, singlespeeds and many that defied classification. I decided to focus on trail bikes. 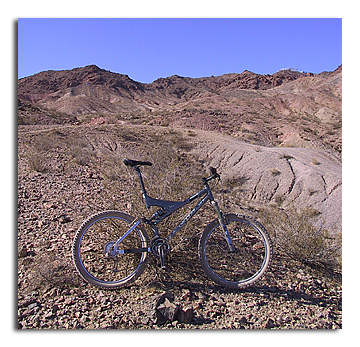 Bikes with more than 4 inches of rear wheel travel that purported to have some climbing ability. The co-conspirator. The first bikes we grabbed were a matched set of Ellsworth IDs. 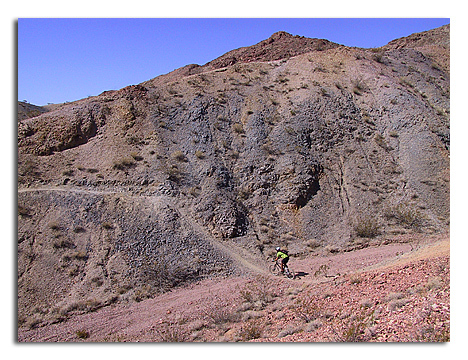 Nice, solid descenders and surprisingly efficient climbers. Santa Cruz Heckler. 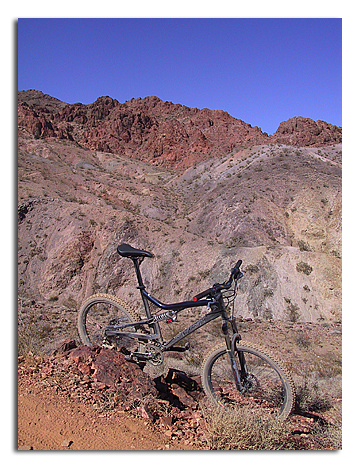 This was the most "freeride" of the bikes I tried. Not quite as happy climbing, but still got the job done. 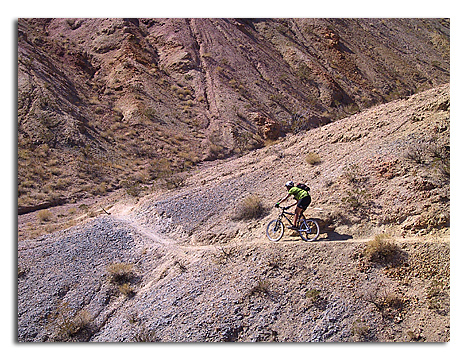 Point it downhill, or even through some even contour line trail and it was a blast to ride. Titus Switchblade. The most XC of the bikes I rode that day. Yeti 575. My pick of the litter. It has that classic Yeti stability on descending, AND this was the best climber of the day. I also rode a Giant VT, which was quite nice. A Balfa Bel-air, which was a confusing and strange bike. A Trek Liquid which struck me as competent and one other that was so unremarkable that I cannot recall it at the moment.